Key Difference: SD cards offer up to 4GB data capacity, while SDHC cards offer up to 32GB. SD cards also have a slower transfer rate and utilize FAT16 filesystem. SDHC cards offer a higher transfer rate and utilize FAT32 filesystem. SD and SDHC cards have become common in today’s technologically advanced world. Both of these cards are removable flash memory cards that can help expand memory or as a memory storage in electronic products such as cameras, cellphones, etc. Though flash memory is also available in USB format, those are known as USB memory sticks and are not defined in this article. The main distinction between SD and SDHC cards are often blurred as both of these are similar in looks and dimension sizes. The only noticeable difference is the file size and the logo on the cover of the card. Secure Digital (SD) card are non-volatile flash memory cards that are used to expand storage in electronic products. The secure digital format is maintained by the SD Card Association (SDA) and has been divided into four families and three different form factors. The four families include Standard-Capacity (SDSC), the High-Capacity (SDHC), the eXtended-Capacity (SDXC), and the SDIO, which combines input/output functions with data storage. The three different form factors in each family include the original size, the ‘mini’ and the ‘macro’. The different sizes are also available with adapters that allow the smaller sizes to become larger sizes for different types of electronics such as computers, cell phones, camcorders, etc. The original SD or the Secure Digital Standard Capacity (SDSC) card and the Secure Digital High Capacity (SDHC) differ largely in the capacity sizes. The SDSC card offered a capacity upt to 4GB, which started proving too small for many consumers, who then demanded higher capacities for data storage. This gave birth to the SDHC card which then offered capacity limit from 4GB up to 32GB. 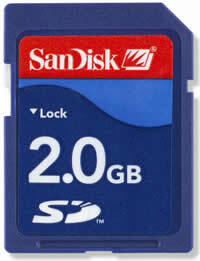 It is also considered as version 2.0 to the standard SD card. Both the cards are identical in looks and size, with the major differences listed only on the top label. The cards also use different file systems in order to maintain the ability to store the data. The SDSC card uses the FAT16 file system which allows it to store up to 4GB maximum storage capacity on the card. SDHC uses FAT32 file system and utilizes sector addressing compared to byte addressing, which allows it a maximum storage capacity of 2TB. 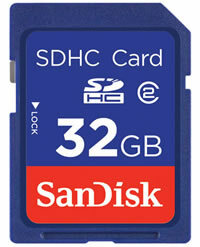 However, SDHC is only limited to 32GB according to the SDA standards. The next version Secure Digital eXtended Capacity (SDXC) capacity has a maximum limit of 2TB. The SDSC also has a slower data transfer rate compared to SDHC. Data transfer rate is the rate at which the system reads and writes the data. SDSC has a transfer rate of 2MB/sec to 4MB/sec, while SDHC offers a transfer rate of 4MB/sec to 15MB/sec. The SDHC is also not compatible with SDSC supporting hardware and many windows computers require a patch in order for the SDSC hardware to be able to support the SDHC card. However, the SDHC hardware has been made backward compatible in order to support SDSC cards. Both of these cards are often used in many different electronic products and as the increase for data capacity continues, it will soon result in the SDSC cards becoming obsolete, with data the minimum 4GB data being offered. SD cards are flash memory storage devices that allow users to expand memory in current electronic products. SDHC cards are flash memory storage devices that allow users to expand memory in current electronic products. Is compatible with SDHC card reader. Is not backward compatible. For computers, a patch is required to make SD card reader compatible. 24 mm × 32 mm × 2.1 mm.